Smilla Finest Healthy Nutrition Sensible is an innovative High Premium complete dry food ideally adapted to the requirements of nutritionally sensitive cats with delicate stomach and intestinal tracts. The high quality, easily digestible dry food was developed in cooperation with leading experts and according to the most recent scientific findings. It contains all neceΒary vitamins and nutrients for a cat life full of vitality. Smilla Finest Healthy Nutrition will not just be loved by your soft-pawed friend, it will also supply it with a balanced and healthy diet. 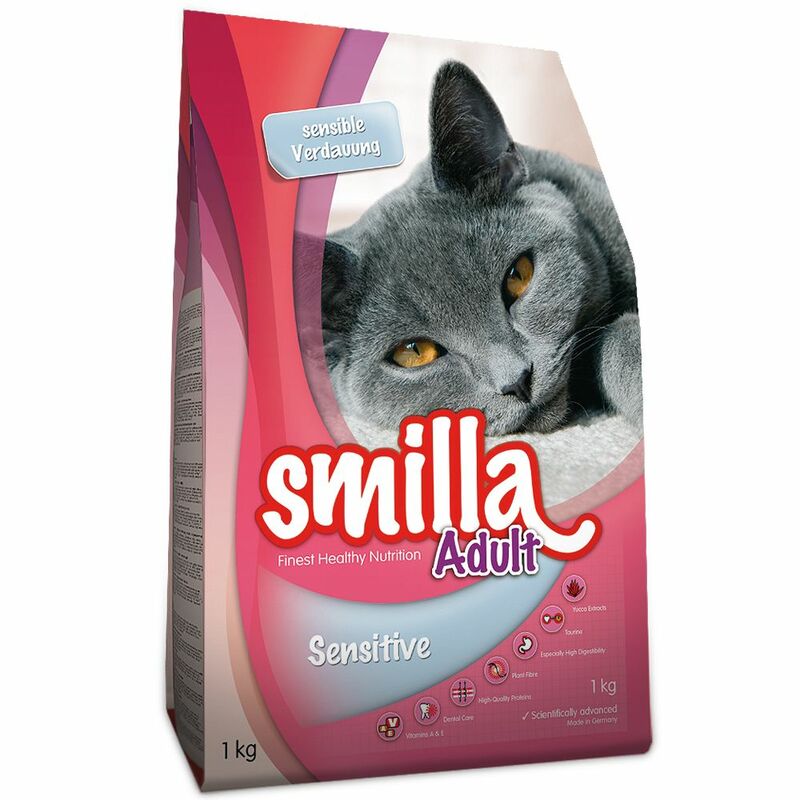 Smilla Sensible is especially tasty and easily digestible and contains the perfect mixture of nutrients for nutritionally sensitive cats with a delicate digestive system. Convince yourself of the unique advantages of Smilla Finest Healthy Nutrition complete cat diet: With vitamins A and E for powerful sight and beautiful skin For effective dental hygiene with special kibble shape and surface With high quality proteins to support organ functions With vegetable fibres for optimal hairball proceΒing High digestibility for ideal nutrient absorption With taurine for strong cardiac function and sight With yucca extracts to reduce stool odour With linseed as a natural source of omega-3 and -6 fatty acids No artificial colour, flavouring or preservatives Non-GMO - part of a balanced diet Comes in a convenient, resealable pack - simply open and enjoy fresh, time and time again Smilla Finest Healthy Nutrition complete dry cat food Sensible - for a healthy and indulgent cat life from one year of age! Smilla is available in the following sizes: 1kg, 4kg and 10kg (2x4kg plus 2x1kg). Price just £2.99! Click here to buy now!